[103 Pages Report] aerospace & defense elastomers market was valued at USD 51.5 Million in 2016 and is projected to reach USD 70.8 Million by 2022, at a CAGR of 5.5% during the forecast period from 2017 to 2022. The growth of the aerospace & defense elastomers market across the globe can be attributed to the increasing demand for new aircraft in emerging economies such as India and China, among others. In addition, the increased rate of replacement of the existing aircraft with new ones is another major factor driving the growth of the aerospace & defense elastomers market across the globe. The base year considered for this study on the aerospace & defense elastomers market is 2016 and the forecast period is from 2017 to 2022. The report aims at estimating the size and future growth potential of the aerospace & defense elastomers market. 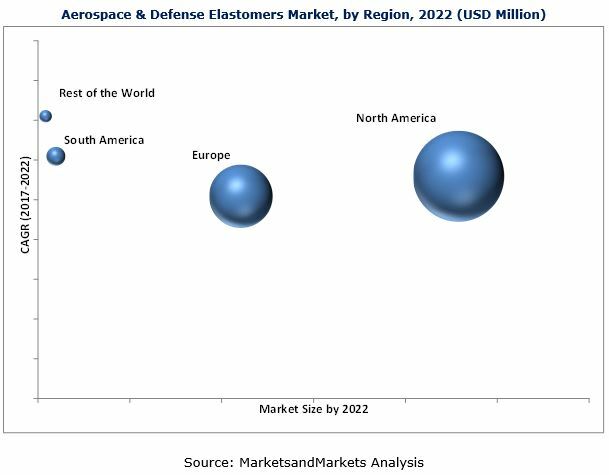 The aerospace & defense elastomers market has been segmented based on type, application, and region. The base year considered for the study is 2016 and the forecast period is from 2017 to 2022. The report provides detailed information regarding major factors influencing the growth of the aerospace & defense elastomers market. It also analyzes opportunities in the market for the stakeholders and provides the detailed competitive landscape for the market leaders. Additionally, the report also profiles the key players operating in the aerospace & defense elastomers market and comprehensively analyzes their core competencies. Both, top-down and bottom-up approaches were used to estimate and forecast the size of the aerospace & defense elastomers market and estimate the size of various other dependent submarkets. This research study involved the extensive use of secondary sources, directories, and databases such as Bloomberg BusinessWeek and Factiva to collect information useful for this technical, market-oriented, and commercial study of the aerospace & defense elastomers market. 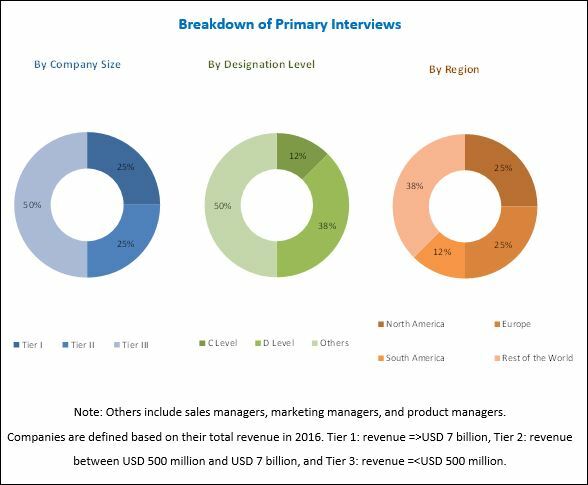 In-depth interviews with various primary respondents were conducted to verify critical qualitative and quantitative information as well as to assess future growth prospects of the aerospace & defense elastomers market. The value chain of the aerospace & defense elastomers market includes manufacturers of aerospace & defense elastomers such as Trelleborg (Sweden), Shin-Etsu Chemical (Japan), Dow Corning (US), Greene, Tweed (US), Chemours (US), Wacker Chemie (Germany), Momentive (US), Saint-Gobain (France), and Solvay (Belgium), among others. This research report categorizes the aerospace & defense elastomers market based on type, application, and region. The market has been further analyzed based on key countries in each of these regions. The aerospace & defense elastomers market is projected to grow from USD 54.3 million in 2017 to USD 70.8 million by 2022, at a CAGR of 5.5% from 2017 to 2022. The growth of the aerospace & defense elastomers market across the globe can be attributed to the increasing consumption of aerospace & defense elastomers in the aviation industry of emerging economies such as India and China. In addition, the replacement of the existing aircraft by new aircraft is also expected to drive the growth of the aerospace & defense elastomers market across the globe. O-rings can be manufactured using various types of aerospace elastomers and are available in all internationally recognized standard sizes. Gaskets are used to completely plug the empty space between two surfaces. The type of elastomers used for manufacturing gaskets depends on a broad range of variables such as working temperature range that gaskets have to withstand, their mechanical properties, and chemical resistance offered by them to acids. The aerospace & defense elastomers market has been studied in North America, Europe, South America, and Rest of the World. The North American region was the largest market for aerospace & defense elastomers market is 2017, in terms of volume and value, and is expected to remain the largest market by 2022. The growth of the North America aerospace & defense elastomers market can be attributed to the upgradation and expansion of the existing aviation infrastructure in countries such as the US. The Rest of the World aerospace & defense elastomers market is projected to grow at the highest CAGR between 2017 and 2022, in terms of value and volume. The increasing demand for aerospace & defense elastomers for assembling different components of aircraft in Rest of the World is expected to drive the growth of the Rest of the World aerospace & defense elastomers market during the forecast period. The highly cyclical nature of the aerospace industry poses a key challenge for the growth of the aerospace & defense elastomers market. The main reasons for this cyclical nature of the aerospace industry are the fluctuations in demand for commercial aircraft and irregular defense spending of developed countries. Apart from that, the general health of the airline industry also affects the sales of commercial aircraft across the globe. Moreover, as the aerospace industry is vulnerable to the fluctuating global situations, it also adversely impacts the growth of the aerospace & defense elastomers market across the globe. The key players operating in the aerospace & defense elastomers market include Trelleborg (Sweden), Shin-Etsu Chemical (Japan), Dow Corning (US), Greene, Tweed (US), Chemours (US), Wacker Chemie (Germany), Momentive (US), Saint-Gobain (France), and Solvay (Belgium), among others. These companies are expected to venture into new markets to widen their customer base and strengthen their market presence. Other manufacturers of aerospace & defense elastomers include Esterline (US), Fralock (US), Chenguang Fluoro & Silicone Elastomers (China), Holland Shielding (Netherlands), Jonal Laboratories (US), Polymod Technologies (US), Rogers Corporation (US), Seal Science (US), Specialised Polymer Engineering (UK), Specialty Silicone Products (US), Unimatec (Japan), and Zeon Chemicals (Japan). 10.11.13 TRP Polymer Solutions Limited.